It's onto the American continent for the final two races of the calendar year, starting off with the Formula 1 United States Grand Prix at the Circuit of the Americas (COTA). This circuit was designed to have the choicest of characteristics from many of the race tracks around the world without copying corners and landscapes outright. 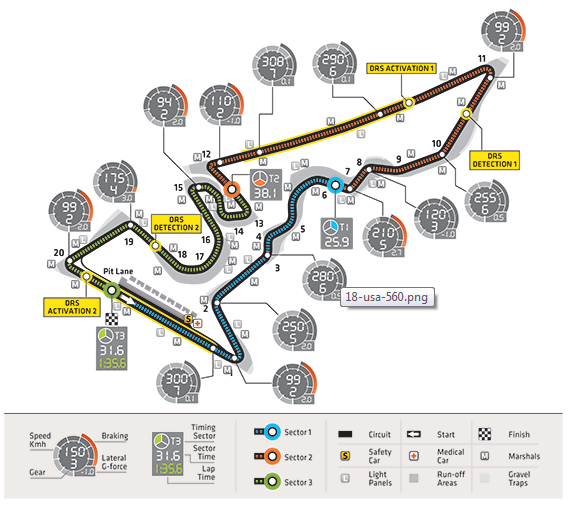 COTA comprises a heady mix of fast and flowing sections similar to the Suzuka Esses and Maggots and Beckets from Silverstone . Some of the slow, twisty and technical parts could remind you of Hungary or Abu Dhabi, while the famed turn 8 from Istanbul is mirrored in the last section of this track. The Americans of course have a "BIg Mac" sized straight, which helped us in 2012 by keeping the championship alive after Lewis Hamilton overtook Sebastian Vettel in a drag down this very straight. Traction out of the slow corners is very important and expect our newly crowned four time world champion and his shiny blue Red Bull chariot to reign supreme yet again. With all teams now properly focused on 2014, the dominance that we have witnessed in the second half of this season is set to continue at the next two races unless Vettel or Red Bull drop the ball and make a mistake. The cars will be setup with medium downforce to manage as much top speed as possible down the back straight and the dramatic uphill start finish straight that leads into a tight blind hairpin. Pirelli are bringing their hardest compounds on offer, ie the Hards and the Mediums to cope with the high energy demands of the first section and the heavy braking loads. With Kimi out of the way, Grosjean will be rearing to stamp his authority over the Lotus F1 Team before the start of the 2014 season to show his bosses that he can lead a team. The arrival of the highly rated Heikki Kovalinen, as has been rumoured, could make things tricky for the Frenchman, but we don't expect any fireworks from the Finn, because it will take time for anyone to get accustomed to a new car, especially after you have been away from regular front line driving for a while. * - Predictions are based on current form and could be revised based on practice results, before we go into qualifying.